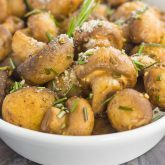 These Baked Parmesan Garlic Mushrooms are seasoned to perfection with garlic, basil, and Parmesan cheese. Easy to prepare and even better to eat, you will be making this side dish all the time! When I was in college, my friends teased me about my lack of domestic skills in the kitchen. Although I knew the basics of cooking, I often took the easy route of preparing packaged meals or having a friend help me with a recipe. Because I lived in my sorority house during my junior and senior years of college, I had to fend for myself, thus the teasing about my cooking took place. No more cafeteria food at the dorms, I was on my own. My sorority had our meals catered during the week, but on the weekends, it was up to you to prepare your own food. You see, I didn’t always know what I was doing in the kitchen. Although I didn’t mind cooking for myself, I never really took the time learn new techniques or tried and true recipe staples. It wasn’t until after I graduated college that I really found my passion of trying out new recipes and creations. 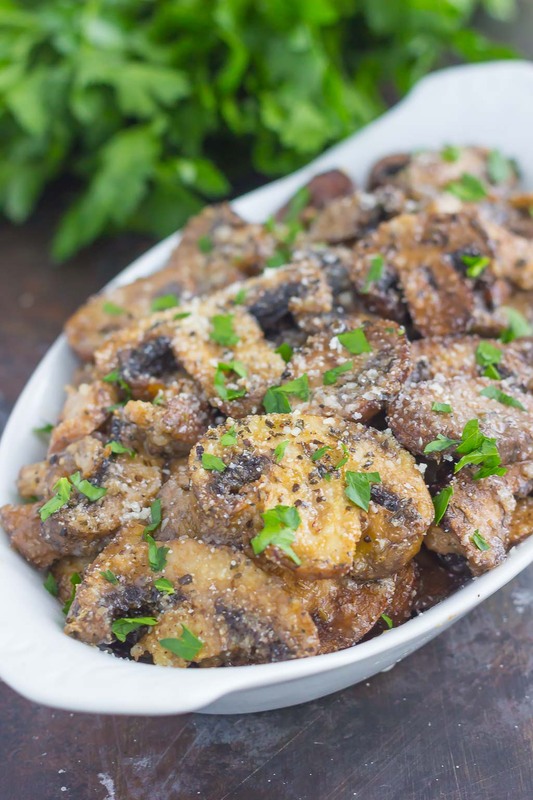 But rewind back to college…one recipe that I loved making for myself was mushrooms. Sounds weird, doesn’t it? But I loved mushrooms back then (and love them even more now)! Growing up, mushrooms were never really prepared in my house because most of my family didn’t like them. So if I wanted mushrooms, I had to order a dish at a restaurant. So when I had the freedom to make whatever I wanted for myself, I often times chose mushrooms. There was nothing fancy about these mushrooms. I simply sauteed them in a skillet with butter, salt and pepper. But man, were they delicious! I would saute a whole container of mushrooms, thinking I would never eat that many. But once they wilted down, I devoured them. And I hardly ever shared, either! My sorority sisters knew that when I was making mushrooms, they were all mine. Fast forward years later, and I still have the same love for mushrooms. I simply can’t get enough of them! On pizza, in pasta, or simply as a side, mushrooms are one of my favorite vegetables to prepare. But now that I’ve been out of college for a while and have many more cooking skills under my belt, I decided to jazz up my standard mushroom recipe. This time, I decided to bake the mushrooms in a variety of spices, instead of sautéing. 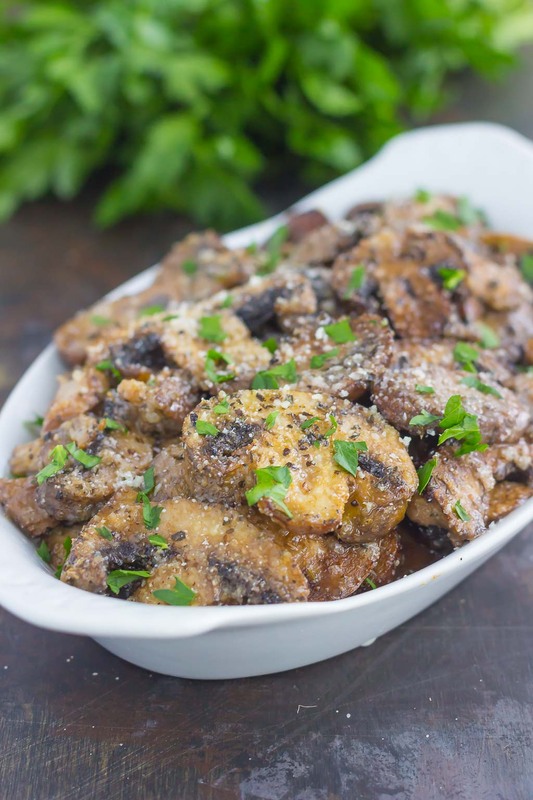 Thus, enter these Baked Parmesan Garlic Mushrooms. Garlic goes with everything, right? You betcha, it’s my favorite spice to bake with, so of course it had to go into this dish. And the beauty of this recipe? It takes about ten minutes to prepare. No sauteing, no flipping, no watching a skillet. 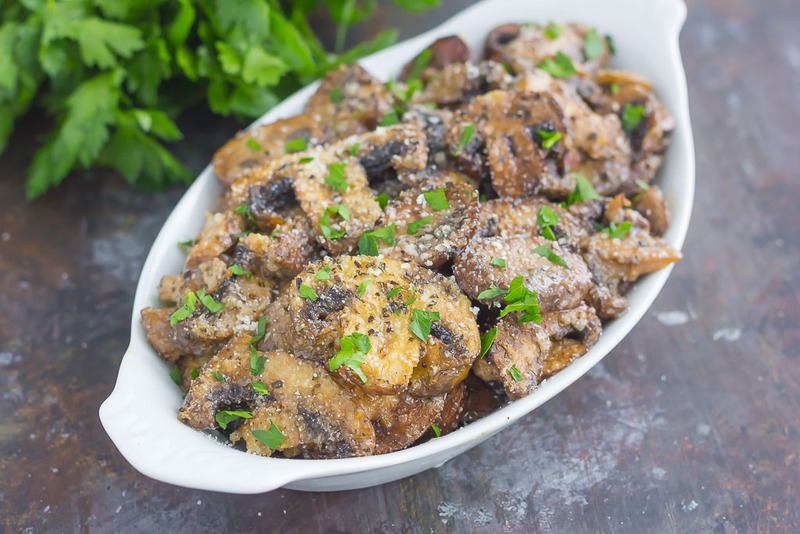 These Baked Parmesan Garlic Mushroom are ready in less than a half hour for you to enjoy. So let’s talk specifics. 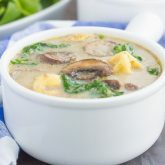 I used two cartons of mushrooms in this recipe, which ended up being around four cups of mushrooms. Any type of mushrooms will do for this recipe. I used one carton of baby bellas, and one carton of regular, white ones. I roughly chopped the bigger mushrooms, keeping the smaller pieces whole. Feel free to chop them into tiny pieces, or just leave them whole. Once they’re baked, they will shrink a lot! I then tossed the mushrooms in a large bowl with some olive oil, salt, pepper, garlic powder, basil, and Parmesan cheese. It may sound like a lot of spices, but trust me, it creates a tasty seasoning for these mushrooms. But if you don’t like these spices, or want to leave something out, feel free. This recipe is easily adaptable to suite your tastes. Once the mushrooms were combined with the spices, I layered them onto a baking tray and popped them into the oven for about 15 minutes. When the mushrooms turned golden, I removed from the oven and patiently waited to try a bite. 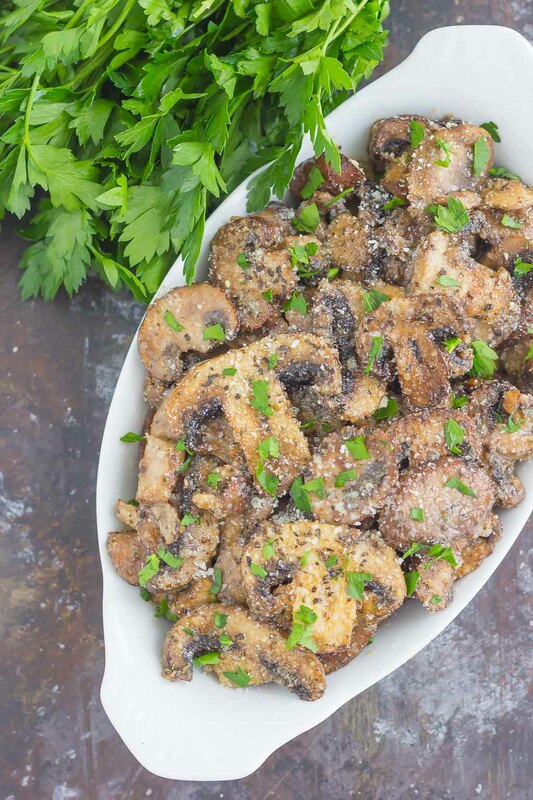 So if you’re looking for a new twist on a classic favorite, why not try these Baked Parmesan Garlic Mushrooms? Easy to prepare and even better to eat, you won’t want to share this dish with anyone else! 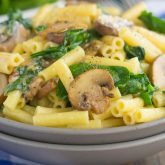 Looking for more mushroom recipes? I’ve got you covered! Roughly chop mushrooms or leave whole, if desired. In a large bowl, combine mushrooms, olive oil, salt, pepper, garlic powder, basil, and Paremsan cheese. Toss to combine, ensuring that mushrooms are evenly coated. Spread mushrooms in an even layer on a large baking tray. Bake for 15-18 minutes, or until mushrooms turn a golden brown color. Mushroom will keep refrigerated, in an air tight container, for up to 5 days. This recipe is easily adaptable to fit your tastes. Feel free to swap in different seasonings or types of mushrooms, if desired. I love how easy these are to bake! The mushrooms actually stay pretty moist and don't bake up with a crust, but the seasonings coat them just as well! OMG these look good! I was also not so handy in the kitchen during my uni days, but I did make my own "special" creations lol. I love the taste of mushrooms, sometimes I actually crave them! Like, I will NEED them. So savoury. I've never tried them this way and I must! I'm glad you share my love of mushrooms, Allison! I think I could eat them just about everyday! And I think you would love this baked version! 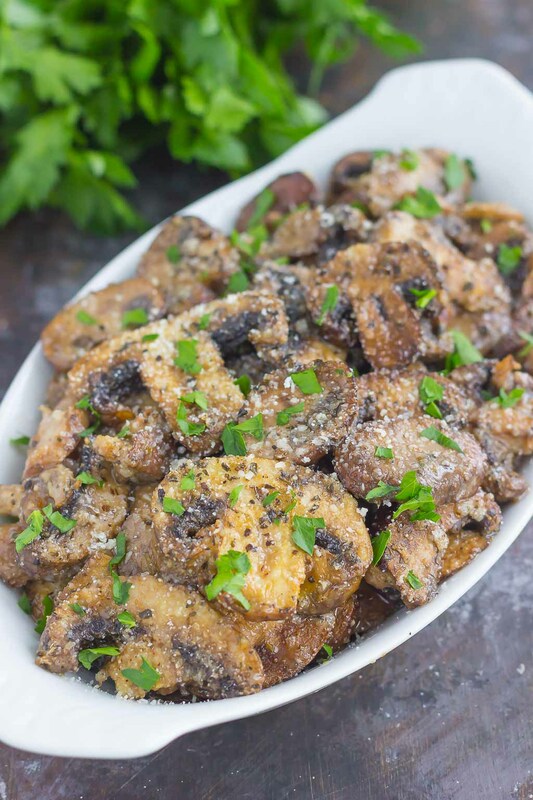 I love baby bellas, and this looks like an easy and delicious way of preparing mushrooms! These look like a great side dish! I bet they are delicious with the garlic and parmesan! Baby bellas are my favorite, too! And this is a very easy and tasty side dish to prepare, and so easy to customize depending on your tastes! I loooove the smell of sauteeing mushrooms...it's heaven! This looks like the perfect, easy, delicious side dish, Gayle! Very easy and delicious, too! I think you will love these, Denise! I've never cooked with mushrooms, not sure if that's sad or not. They always intimidate me, these look really delicious and easy though! I'm sure your husband would love these, Isadora! And it's easier to just bake them, rather than sauteing! And of course the Parmesan and garlic makes it so tasty! My husband doesn't like mushrooms either, so I actually don't make them too often, because I end up eating the whole bunch all by myself! I need to develop more self control with these babies! 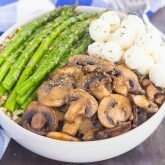 :) The garlic makes these mushrooms so delicious, I think you would love them! Thanks, Samina! You should try these out sometime, the garlic is amazing on the mushrooms! My take?.....that men love mushrooms. And women love Parm cheese. The best of both worlds!! And EVERYBODY love garlic, hehe. This will sound crazy, but I don't think I have ever baked mushrooms. I actually don't think I have ever even thought of it! We always just cook them in the skillet or grill them. I love this idea, right up my alley! I can't wait to try them! I was the same way until just recently, but now that I've tried baking mushrooms, I don't think I'll ever go back to the skillet method. So much easier and just as tasty! Gosh, these mushrooms look so so good!! Mushrooms sauteed in butter is one of my fav things to eat. I have never thought of baking them. What a great idea and they look beyond delicious. Will be trying this soon! Thanks, Christin! I'm sure you will love the baked version just as much as sauteing them! And they're so easy to whip up, too! Oh man oh man do I love mushrooms! Every time I make about a pound and think I'm making too many, turns out I always need more because we eat them too fast. Great idea to bake them! Add in some Parmesan and garlic? Amazing! I'm so glad you like them too, Natalie! I think mushrooms are very underrated! :) These baked ones are delicious and so easy, I'm sure you'd love them!